Submitted photo The AFRL Materials and Manufacturing Directorate Erosion Team conducted a series of coatings durability tests for NASA’s Mars 2020 rover, pictured here in an artist’s rendition. WRIGHT-PATTERSON AIR FORCE BASE — Wright-Patterson Air Force Base Air Force Research Lab researchers are doing their part to make the next Mars rover mission an astronomical success. At the request of NASA’s Jet Propulsion Laboratory and project partners, AFRL recently concluded a series of tests in the Particle Erosion Test Facility, located in the Materials and Manufacturing Directorate’s Coatings, Corrosion, and Erosion Laboratory. For this effort, AFRL experts evaluated the effects of dust, particulates and small rocks on the protective surface coatings of the Mars 2020 rover vehicle. Mars rovers are sophisticated, multi-instrumented pieces of equipment that travel over the surface of the Red Planet recording data, performing mechanical tasks and essentially serving as moving laboratories. 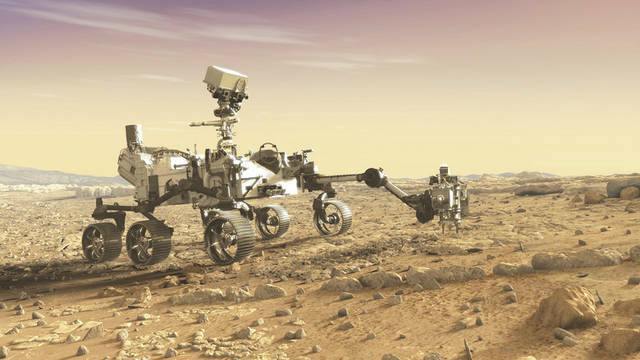 It stands to reason, therefore, that project engineers need to ensure that the rover is well-protected for the entry into the planet’s often inhospitable environment. When a rover is deployed onto the Martian surface, it is released from an atmospheric entry vehicle, where it parachutes down onto the planet surface. This entry is particularly hazardous, as blowing sand and gravel pose tremendous risks. This debris can strike the surface of the rover, potentially damaging the critical protective surface coatings of the vehicle. In the Particle Erosion Test Facility, or the “sand-rig,” as it is informally called, AFRL researchers took coated test specimens and blasted them with particulate matter that ideally would match conditions experienced during the exploratory mission. For this particular effort, researchers performed two distinct tests events. In one set of tests, the team used a finer-grain media to batter specimens at speeds of up to 500 mph. In the other set, an instrument called a gravelometer was utilized to propel larger gravel-sized rocks toward the candidate materials. Throughout the test event, the team was replicating potentially the most extreme conditions that the rover would experience during the entry process. Shumaker said the tests generated valuable data that they then provided to their customer. The information gathered from these tests will help project designers understand the durability of the materials and make the necessary adjustments, if any. This is not the first time AFRL has conducted such tests for the Mars rover design team. Shumaker said similar tests were conducted for the rover Curiosity, which was launched in 2011 and is continuing to perform tasks on the planet’s surface. Shumaker said that over the years, the team has successfully provided critical data to many customers throughout the government, military, and commercial sectors, as a non-biased, rapid-response test facility. The Particle Erosion Test Facility is one of many testing capabilities housed within the AFRL Coatings, Corrosion and Erosion Lab. The AFRL Erosion Lab is also home to advanced laboratory capabilities for in-depth environmental particulate analysis. According to Shumaker, this combination of test equipment along with the group’s expertise and characterization capabilities enable the AFRL Erosion Team to be a world leader. He said the Erosion Team is also involved within the NATO Science and Technology community, providing information on the impact and degradation effects of environmental particulates on platforms. Shumaker said he especially anticipates capability growth in the area of environmental materials characterization, or in other words, the analysis of different types of sands, volcanic ash, and other similar materials. He said the group is already expanding their capabilities in this area, noting that this capability is vital in understanding how different types of particulates interact and impact coatings durability throughout military platforms and engine technologies. Shumaker said that knowing the work the AFRL team does and the benefit it brings to platforms such as the Mars rover makes the job especially rewarding. “The testing we’ve done here will have an impact on the mission, and that’s what it’s all about,” he said. https://www.fairborndailyherald.com/wp-content/uploads/sites/50/2018/06/web1_afrlrover.jpgSubmitted photo The AFRL Materials and Manufacturing Directorate Erosion Team conducted a series of coatings durability tests for NASA’s Mars 2020 rover, pictured here in an artist’s rendition.